When you're coordinating a race or a sporting event and you need to get the attention of the participants, big and bold is the only way to do it. You can't politely tap them on the shoulder and say, “Hey! The finish line is this way.” Boundaries need to be clearly marked, routes must be obvious to runners with serious cases of tunnel vision and, corporate sponsors' banners must be visible. That's a lot to ask, but there are ways to make it happen. Sporting events are a natural fit for inflatable buoys. Boat races, surfing tournaments, and just about every other water sport has a need for markers, whether it be for outlining the entire route or just the finish line. Inflatables work as well on the water as they do on the land, so your branding will stay consistent from beginning to end. And unlike traditional buoys, inflatable pylons aren't limited to the standard round design, which makes them easier to customize with your logo or that of your sponsor. For golf course managers, inflatables are the obvious choice because they don't damage the delicate greens like heavy construction materials can. Using inflatable pylons instead of more traditional signs and marketing materials means less money spent on repairs when the event is over, and fewer headaches for you. In addition, airtight pylons don't require a power source or need a blower to keep them inflated, so they're quiet. A mandatory feature on a golf course. Poker runs, concerts, and charity walks are mainstays in the fundraising world. So is having too little staff to keep everything going. Even a squadron of enthusiastic volunteers will have trouble keeping several hundred bikers on track, but twenty-foot-tall inflatable pylons make it clear where the next checkpoint is. Perhaps equally important, they provide ample space for advertising, so your sponsors know they are getting their money's worth. Groundbreaking ceremonies, park dedications, parades, and festivals all make good use of inflatable pylons. They perform double duty as placeholders and billboards, both marking the location of an event and promoting the businesses that made it possible. Plus, they deflate quickly and take up little storage space. On a hot day in July when thousands swarm the beach, your job as a lifeguard is in full swing. If you find yourself in need of some added help with crowd control, inflatable pylons make a great backup crew. They're both lightweight and portable, and since they're airtight, they work just as well in the water as out. Durable, fade-resistant materials keep them going year after year, so you'll be a hero at the next budget meeting. Regardless of the type of event, inflatable pylons are heavy-duty multitaskers. They direct traffic, mark important spots, and outline routes, giving you full-time workers for a part-time price… and they never call in sick. Who could ask for more? Want more creative ideas for using pylons & buoys at racing events? 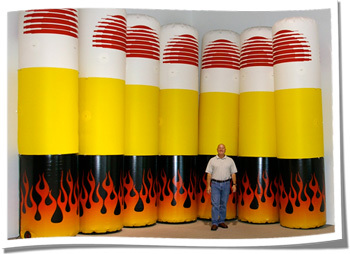 View our inflatable pylons / buoys gallery.